French toast is also known as gypsy toast, eggy bread, or omelette bread. It is a dish of bread slices soaked in beaten eggs and then pan-fried. The earliest reference to this dish dates back to the 4th or 5th century. In the 15th century, it was first referred to as “pain perdu” (French for “lost bread”). It was so named because it was typically made with stale bread. French toast is still called pain perdu in France, Belgium, Acadiana, New Orleans, and the Congo. In Quebec, they call it golden bread – pain doré. French toast can be served either as a sweet or as a savory dish. When it is served as a sweet dish, eggs are usually beaten with milk, sugar, cinnamon, or vanilla. It may be topped with powdered sugar, syrup, butter, honey, jam, fruit, or other toppings. Savory French toast is usually fried with a pinch of salt and can be topped with cheese, bacon, or meat. To cook French toast, crack an egg in a medium bowl. Add 1/4 cup milk, 1/2 tsp cinnamon, and 1/2 tsp vanilla extract. Mix together. Heart a pan with 1 tsp butter on medium heat. Dip both side of a slice of bread in mixture. 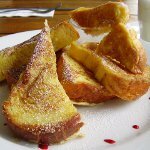 Chefs recommend using stale bread for cooking French toast because it soaks up more egg mixture without falling apart. Fry on both sides until brown.